Q: Which stadium is the best in the Sunflower League? A: The new stadiums being built in Lawrence appear to be state of the art, and the new SM North stadium is as nice of a facility as you can find in Kansas. However, I would still maintain that the charm of the Olathe District Activities Center (ODAC) is undeniable. The drive through the cornfields to the stadium adds to the mystique, and the stadium itself has housed countless All-State players and championship teams. Also, ODAC still fields a grass playing surface, something that is becoming more and more uncommon in Johnson County, and around the state of Kansas. Given all of the history, and the certain "field of dreams" aura the stadium holds, I would have to give ODAC the nod for the top stadium. Q: Which football team is the best of the decade? 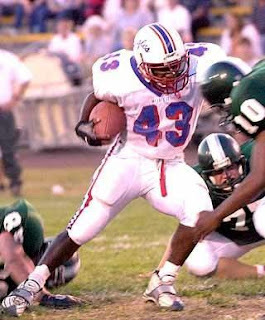 Olathe North's top two running backs in 2000--senior Darren Sproles (right) and junior Maurice Mack--combined to total 3,464 rushing yards and 60 rushing touchdowns that season. Olathe North scored 35 or more points in 11 of their 12 games. Olathe North's defense gave up, on average, 8.2 points per game. Forget top team in the conference for the decade, that Olathe North team was the best team in the state of Kansas the past 10 years. They ended the 2000 season on a high note, beating Manhattan in the 6A title game by a score of 42-7. Sproles has five touchdown runs in that title game. Q: What is the best rivalry? A: I have stated this before, and I will state it again--the Lawrence vs. Lawrence Free State game is truly the biggest rivalry game in the Sunflower League. I didn't realize the magnitude of the contest until I spent my freshman year of college at KU in Lawrence, and was able to experience first hand the competitiveness between the two schools. Just in case you're interested, the two teams square off October 23. Q: When will the 6A State crown return the Sunflower League? A: Presumable this upcoming season. Olathe North won the title from 2000 through 2003, and since then, the league is 0-5 in the 6A title game. The good news is that there doesn't appear to be a dominate 6A team on the Central or Western part of the state in 2009. If the East side of the state (and more specifically the Sunflower League) is going to regain the title it needs to be this year. With Hutch likely returning to 6A in 2010, the title will only become more competitive next year. Q: What game has had the biggest impact on the Sunflower League the past 10 years? A: The game I would point to would be the 2003 match up between Olathe North and SM North. Gene Wier had departed Olathe North to become the head coach at Richland High School in Texas, and meanwhile John McCall was in his first game as the head coach of Olathe North. On the other side of the coin, SM North was coached by chiseled veteran Sam Brown. Brown was returning one of his best Indian teams in his tenure, and on that night they had Olathe North's number. The game was a rather boring contest, filled with sloppy play and uncontrolled nerves. In the end, SM North won the game 7-6, snapping Olathe North's win streak at 38 games. What came of the game? Olathe North went 10-3 and won the 6A state championship that year, but things just didn't seem the same without Weir at the helm. The following year Olathe North looked like the best team in the state of Kansas for 12 weeks before falling the state championship game. John McCall left to join Wier's staff in Texas following the 2004 season. SM North finished 2003 with a record of 6-3, and then went 5-4 in Brown's last season at SM North in 2004. Brown returned to coach his Alma mater, Excelsior Springs High School, where he has remained the head man since 2005. Q: What game has been the biggest upset of the decade? A: This one is difficulty to figure for sure, but I would go with SM West's defeat of Olathe East in the 2004 Sectional Round of the playoffs. SM West had gone 2-7 in 2003, before changing things around in 2004 and completing the regular season 7-2. Olathe East on the other hand was as loaded as ever. They had gone 8-1 during the regular season, and looked primed to take the 6A title. 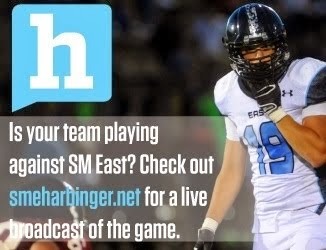 In fact, nearly every media pundit in the area was choosing Olathe East to win the game. What happened? Olathe East came out cold, and SM West came out on fire. SM West's Andrew Patch caught a deep touchdown pass early in the first quarter to give SM West a 7-0 lead, a lead which they would hold throughout. A couple DJ Barnett touchdowns gave the Vikings a 21-0 lead when the final whistle blew. Perhaps the craziest thing about that game was that Olathe East's do-it-all freak, Andre Jones, was held to a mere 18 yards rushing. SM West lost to Olathe South the next week in the State Semi-finals, but their shutout upset over the Hawks still ranks as my top upset of the decade.